Please Note: This unit is for Personal use only, not for Commercial use. If the product is used for commercial purposes the warranty will not apply. US 1000 3rd Edition is an FDA approved portable therapeutic ultrasound unit. New, Now with 3 power output settings. cells, increasing temperature and inducing vasodilation. within soft tissue cells, increasing temperature and inducing vasodilation. 4 CHANNELS PLUS EXTRA LARGE LCD DISPLAY! Introducing the all New Powerful 100 milliamp Tetra™ TENS/EMS Combo 4 Channels, 8 Modes with 2 adjustable timers, AC Adaptor. Treat two areas at the same time. Pain management and muscle rehabilitation in one pocket sized unit! 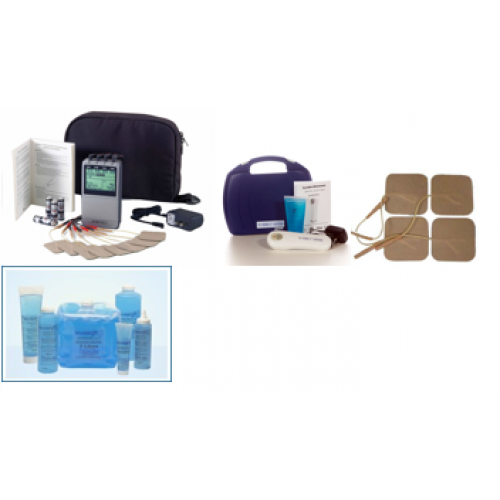 This combination unit is ideal for patients with chronic conditions that may benefit from both TENS and EMS therapy. The extra large display also makes it ideal for older patients or those with vision impairment. Timer: 2 timers. 5 - 60 minutes or continuous, adjustable in 5 minute increments, with a final countdown at 5 min. Includes Patient Compliance meter (60 sets of records, total 999 hours). Comes with a user manual, 8 electrodes, hard carrying case & battery. Pain management and muscle rehabilitation in one pocket sized unit! 4 channels, 8 modes, and strong 100mA output. The Tetra™ TENS/EMS is an exact combination of our TENS 7000 and EMS 7500, which gives the user the choice of 5 TENS modes and 3 EMS Modes. Includes carrying case, manual, battery, AC adaptor, leadwires, 8 electrodes, 1 year warranty. Common Uses: Back pain, Neck pain, Joint pain, arthritis, post-op pain, post-traumatic acute pain, chronic pain. Modulation mode: is a combination of pulse rate and pulse width modulation. The pulse rate and width are automatically varied in a cycle pattern. The pulse width is decreased by 50% from its original setting in 0.5 second, then the pulse rate is decreased by 50% from its original setting in 0.5 second. Total cycle time is 1 second. In this mode, pulse rate(2-150Hz) and pulse width(50-300uS) are fully adjustable. The SD1(Strength-Duration) mode: consists of automatic modulation intensity and pulse width in 40% range. The intensity is always increasing while the pulse width is decreasing and vice-versa. The intensity is decreased by 40% while the pulse width is increased by 40% in 5 seconds. In the next 5 seconds, the intensity is increased by 40% while the pulse width is decreased by 40%. Total cycle time is 10 seconds. Pulse rate(from 2~150Hz) and pulse width (from 50~300uS) are fully adjustable. Constant: Constant stimulation based on setting value. Only pulse width, rate, and timer are adjustable in this mode. Constant is equal to "Normal" TENS mode. Timer: 2 timers adjustable from 1 to 60 min, or continuous. Adjustable in 1 minutes each step from 1 to 15 minutes and 5 minutes each step from 15 to 60 minutes. Treatment time counts down automatically. Low battery indicator: A low battery indicator will show up on the LCD when the battery is low. System Includes: Stimulator, Lead Wires, 8 high quality Self-Adhesive Electrodes, 4 AA Batteries, AC Adaptor, Soft sided Carrying Case, Instruction Booklet.